As most everyone knows, Niagara Falls is actually two separate waterfalls. One is in the United States, the other -- the Horseshoe Falls -- is controlled by Canada. 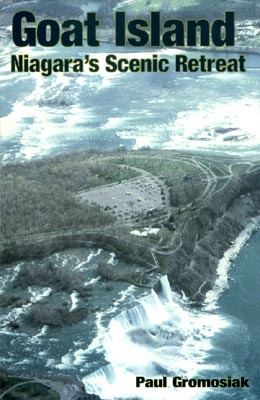 But since both begin in the Niagara River and end up in the same waters below, what separates them? This is the story of a crucial piece of real estate with a rich history. Goat Island sits astraddle one of the great natural wonders of the world. Over the years, this small island has accumulated a large list of tales. Who better to tell them than Paul Gromosiak, the foremost authority on Niagara Falls? He is the author of eight books on this international attraction and its long and amazing history. Read the story of how Goat Island got its name, and how even when they tried to rename it "Iris Island," the new name never stuck. Learn how the island houses the last remaining structure of what used to be the world's first alternating current power plant, as well as the statue honoring the man who envisioned that power system, Nikola Tesla. Goat Island also weaves in bits of history from the Devil's Hole, Cave of the Winds, and the other islands above the falls, including the Three Sisters.